Welcome to The Treeographer, a collection of the true histories of significant or symbolic trees from around the world. The stories cover a wide variety of topics, including culture, history, science, religion, and more. I hope you’ll join me as I explore the interlacing history of man and tree. All of the stories to date are organized geographically in the Archive. If you aren’t sure where to start, try Ogawa’s Sacred Cedar – A 780 Million Yen Rescue Mission. You can also see a few of the most recent posts below. You can find out more about me and why I started this project on the about page. If you just can’t get enough tree stories, check out the recommended reading page for a carefully curated list of the best tree books available! Have an idea for a tree that would make a great article? Send me a message on the contact page and I’ll get back to you as soon as possible. Tree fans rejoice, as voting for the 9th annual European Tree of the Year contest is now open. This year the number of participating countries has increased to 15, with France and the Netherlands joining in on the fun. Each year on September 11th the world reflects on the terrorist attack on the World Trade Center that forever altered the course of history. The site of the attacks is now home to the 9/11 Memorial Museum, and the 9/11 Survivor tree, despite growing just beneath where the towers fell, stands tall in the Memorial Plaza. After a month of going through the rubble, rescue workers were surprised and delighted to find a callery pear tree still clinging to life. Amidst the death and destruction, it represented a glimmer of hope. Charred with just one branch still alive, the tree first planted in the 1970s was nearing its end. It was quickly transferred to Arthur Ross Nursery in the Bronx to recover along with 6 other trees pulled from the rubble. The 6 other trees were planted in several locations in Manhattan, but the tree required much more intensive care to recover. 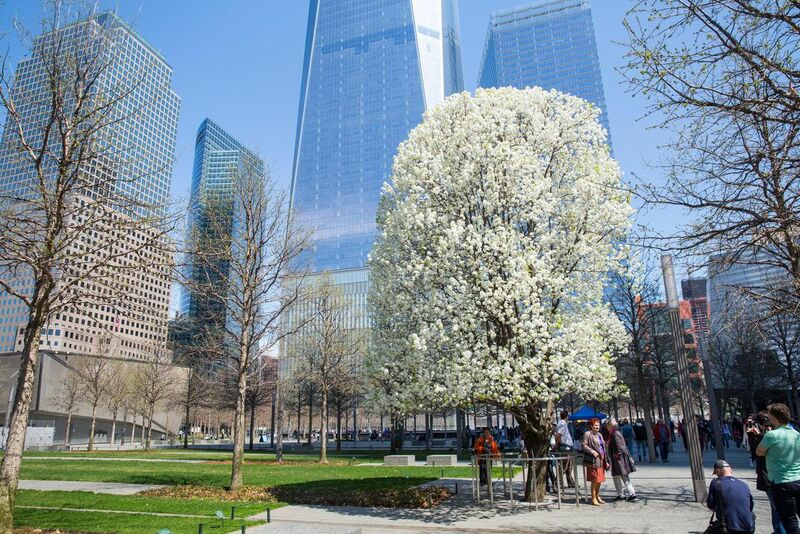 Years after the attacks, the callery pear was replanted in the World Trade Center Memorial Plaza in 2010, alongside rows of swamp oak trees. It was christened ‘The Survivor Tree’ and celebrated with a children’s poem titled “The Survivor Tree’s Testimony“, read here by Whoopi Goldberg. The 911 Survivor Tree is far from the first memorial tree, even in the United States. Another famous Survivor Tree in Oklahoma was inaugurated in 1996 after the Oklahoma City bombing that killed more than 150 people. Trees have a much longer history around the world as memorials for lives lost, but much of what we see today can be traced back just a few centuries. That story starts where most stories end – the graveyard. As cities in Europe grew larger and larger, city planners were forced to move cemeteries into the outskirts of urban areas. Land was much more plentiful there, and they helped manage the danger of disease in high population areas. However, few residents wanted to visit lines of tombstones so far from home, let alone be buried there and forgotten by their loved ones. Plus, the new cemeteries were not blessed by the Catholic Church. To combat this, landscaping specialists were brought in to overhaul the image of these new rural cemeteries. Trees and grass were planted to make them more attractive to visitors and remind them of a simpler time as they mourned the deceased. The first successful ‘garden cemetery’ was Père Lachaise Cemetery in Paris. When it was opened in 1804, it offered a radically different experience than the cramped and spooky city cemeteries people were used to. After a few years (and some high profile burials), Père Lachaise Cemetery’s green grass and carefully managed trees caught on. It has since been expanded five times, and currently serves as the final resting place for more than 1 million bodies. Countless more cremated remains are housed in the crematorium. The cemetery remains well-known internationally today due to a few celebrity residents. 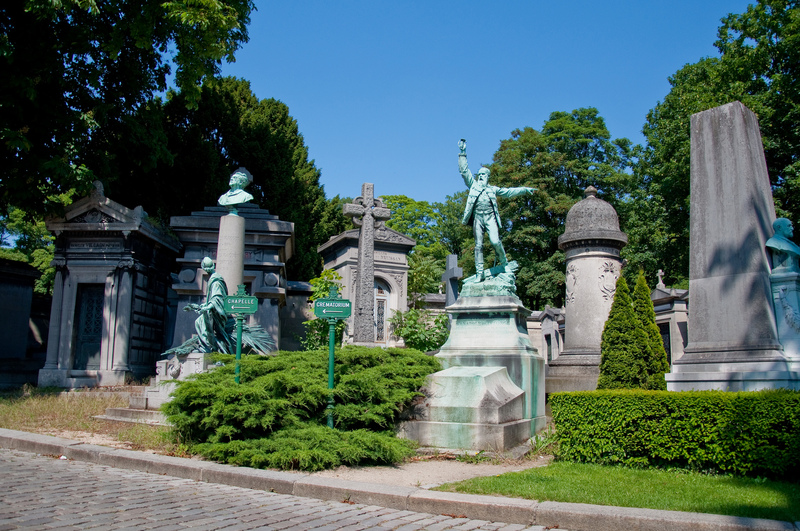 It contains the tombs of Oscar Wilde, Frederic Chopin, and Jim Morrison among others. The curious concept of garden cemeteries spread quickly throughout Europe and the United States. Mount Auburn Cemetery near Boston opened in 1831, and later inspired many more in the US and abroad, including London’s Abney Park Cemetery. Eventually, cities grew to engulf these landscaped areas, and urban dwellers decided they liked the new green spaces but could do without all the dead bodies. This led to an explosion in city parks throughout the Western world in the second half of the 19th century. While trees served merely as a backdrop for memorializing the dead in garden cemeteries, later movements imposed a much more direct relationship between trees and the dead. 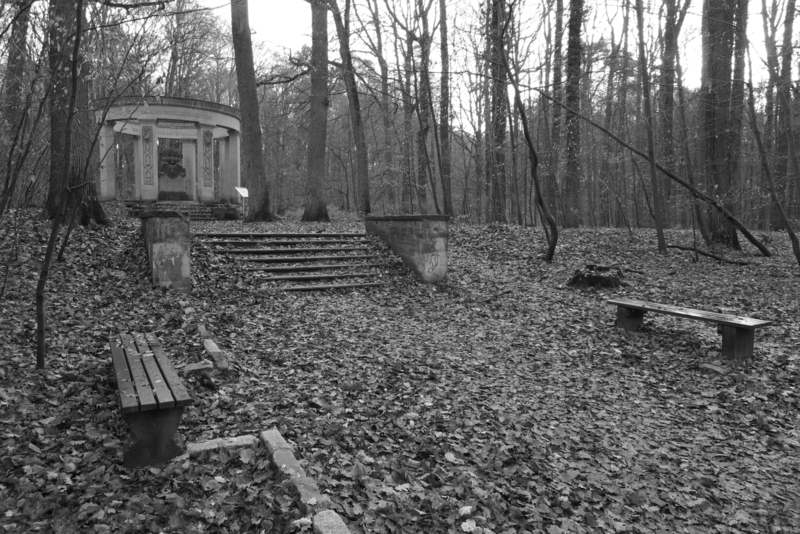 One such movement was the German Heldenhain, or Heroes’ Grove, originally thought up by landscape architect Willy Lange in 1914. In a heroes’ grove, an oak tree is planted for each fallen soldier. Oak trees were chosen because they are strong and massive but grow slowly, imbuing an everlasting continuity to the memorial. Perhaps the largest instance of individual trees standing in for lost lives is the Forest of the Martyrs near Jerusalem. In it, a tree was planted for each of the 6 million lives lost during the holocaust. In addition to the trees, the Forest of the Martyrs is home to many museums and memorial monuments dedicated to the many groups targeted. A more recent example is the National Memorial Arboretum in the United Kingdom. Although it doesn’t feature a single tree for each service member lost, it does feature many trees and memorials for military campaigns around the world. Near each memorial, trees from the region they took place have been planted as a tribute to the fallen soldiers, volunteers, and civilians. Like a memorial monument or plaque, memorial trees planted after a tragedy occurs are aimed at future generations. They are a way for those who lived through the event to ensure that it isn’t forgotten, but don’t serve as symbol of what they went through. Survivor trees, on the other hand, are a powerful symbol for both those who lived through the tragedy and future generations to come. They symbolize not only survival, but also regrowth of a community. The 9/11 Survivor Tree is without a doubt the most well known survivor tree in the world. Not long after it was planted at the newly created World Trade Center Memorial, its influence began to spread across the nation, and later, the world. In the years since the September 11th terrorist attacks, a number of other terrorist attacks and natural disasters have occurred all over the world. To spread the strength of New Yorkers following the worst terrorist attack in the history of the United States, each year 9/11 Survivor Tree seedlings are sent to three cities around the world. The first group of recipients in 2013 included Boston, Massachusetts, which had just suffered a terrible attack at the Boston Marathon. In 2014 a tree was sent to Fort Hood, Texas in honor of the attacks that killed 13 service members and wounded many others. The first international recipient of a 9/11 Survivor Tree Seedling was Madrid, in memory of the 2004 attacks on commuter trains that killed 193 people. The tree itself was planted at the Spanish embassy in Washington DC. The first seedling to be planted abroad was given to France in 2016 in memory of the attacks on Paris and Nice. It can be found on the grounds of the Ministry of Foreign Affairs on Quai d’Orsay. What was once a humble callery pear tree that thousands of office workers walked past every day without a second glance is now a worldwide symbol of resilience. Each year at the beginning of Summer it comes to life with thousands of white blossoms, reminding all of us that even in the worst of times life will go on. If you enjoyed this article about the 9/11 Survivor Tree, check out the archive for more tree stories. Also check out the Facebook page, with a few extra tree goodies throughout the week. Subscribe below to receive notifications whenever a new tree story is published. Tucked away just outside of Doñana Natural Park in Huelva, Spain, a small grove of wild olive trees has survived for centuries, even as the landscape around it underwent radical transformation. The Acebuches de El Rocio are a group of 15 ancient wild olive trees located in Plaza Acebuchal in the village of El Rocio. Wild olive trees (acebuches in Spanish) are native to the Iberian Peninsula, and despite their humble reputation, they are much more than just uncultivated olives. Pinsapos, or Spanish Fir trees, are exceptionally rare. They are found in just a few mountain ranges in Andalusia and Morocco, with one of the largest pinsapo forests located in the volcanic soil of Sierra Bermeja. It was here that the trees were first introduced to the world of science in 1837, and today it remains one of the best places to visit these spectacular trees.